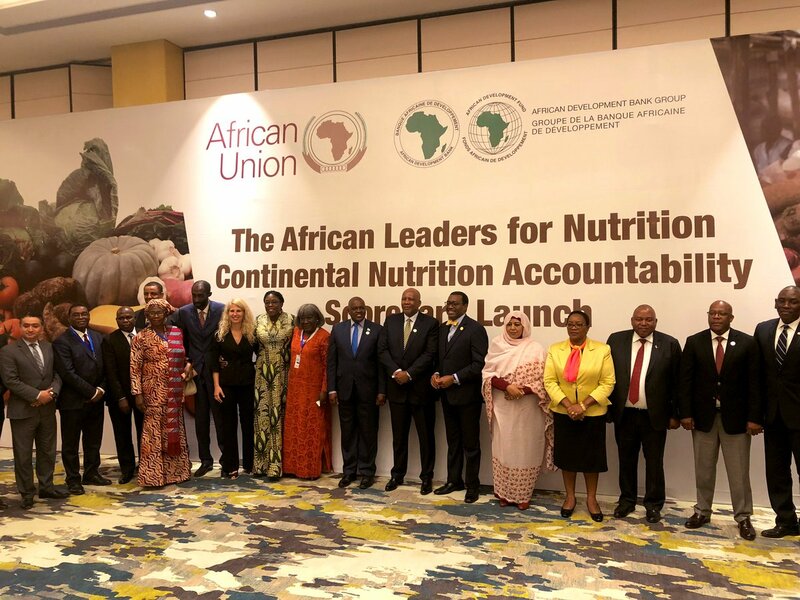 The African Union Commission, the African Development Bank and global partners today launched the Continental Nutrition Accountability Scorecard to raise awareness and reinforce commitments by African governments to help end malnutrition. His Majesty King Letsie III of the Kingdom of Lesotho and African Union Champion for Nutrition, and Dr. Akinwumi A. Adesina, President of the African Development Bank co-hosted the scorecard launch on the sidelines of the 32nd Ordinary Session of the Assembly of Heads of State and Government of the African Union in Addis Ababa, Ethiopia. “The nutrition accountability scorecard offers an opportunity to lay a solid foundation to aid African leaders to act strategically and deliberately in implementing policies and investing in nutrition programmes that tackle malnutrition in our respective countries,” King Letsie III told attendees. “As responsible leaders, the onus is on us to take action for the wellbeing of the African people. We need to take appropriate and decisive actions now rather than later,” he added. In attendance were Dr. Mokgweetsi Eric Keabetswe Masisi, President of the Republic of Botswana, members of the diplomatic corps, health ministers from Malawi, Botswana, Kenya, Senegal, Gambia, Ghana, and development partners including FAO, WHO, UNFPA, UNICEF. In his remarks, President Masisi commended the Bank for the initiative. “I am so proud about the African Development Bank’s involvement… the scorecard is an extremely useful tool. It is important to get a continental picture of the state of our nutrition so that we ask ourselves the right questions to make sure we get our priorities right and fix them,” he noted. The Continental Nutrition Accountability Scorecard is produced by the African Leaders for Nutrition Initiative (ALN), headquartered at the African Development Bank, in collaboration with ALN’s partners including the Global Panel on Agriculture and Food Systems for Nutrition, and the Bill and Melinda Gates Foundation. “We must change how we look at the problem of malnutrition. The greatest contributor to economic growth is not physical infrastructure but brainpower, what I refer to as “grey matter infrastructure”. While it is obvious that a road and a port can add to improved trade and economic growth, it is often not recognized that stunting shrinks the size of the brain and therefore compromises the current and future economic growth of nations,” said African Development Bank President Akinwumi Adesina. Africa remains the only continent with high levels of malnutrition, and suffers slow progress to reverse the situation in comparison to the rest of the world. United Nations data indicate the number of stunted children in Africa increased sharply from 50.6 million in the year 2000 to 58.7 million in 2017. A growing body of evidence recognizes that malnutrition and economic development are closely interlinked. Poor nutrition is responsible for stunting children’s growth, harming children’s educational development and future economic prospects. The scorecard launch presented key findings and recommendations, including calls for governments to increase budgetary allocations for multi-sectoral nutrition plans. The scorecard also calls for the enhanced empowerment of women and adolescent girls and the provision of nutritional support at the most critical time of a child’s life – during pregnancy and early childhood. The nutrition assessment tool provides a snapshot of the status of key nutrition indicators, including internationally agreed nutrition targets, specific interventions, sensitive interventions, policy and legal provisions, nutrition financing, and socio-economic impacts. “Over time, the Continental Nutrition Accountability Scorecard will expand in depth, data and usefulness, and will help to identify solutions to mitigate the burden of malnutrition that has impeded the continent for the past few decades,” said Jennifer Blanke, Vice President for Agriculture, Human and Social Development at the African Development Bank. ALN targets the highest levels of African governments to build advocacy for improving nutrition across the continent. “Let us rise and do the right thing for Africa’s children: secure their future with better nutrition. Let us turn the red colours on these scorecards to green. Let us score goals for nutrition in Africa,” Adesina concluded.